It’s pretty crazy that a tiny little ding in your car door that’s smaller than the size of a quarter can cost hundreds of dollars to fix at a local auto body shop. Of course, people who follow the BGR Deals team won’t pay anywhere near that much. Why? Because they’re smart enough to snag a Yoohe PDR Tools Pops-a-Dent Dent Puller Kit to have on hand in case anything dents their cars. This great kit uses the same type of method your local body shop uses, but it’s miniaturized and simplified. It’s also available at a small fraction of what you’ll pay at the shop. You obviously won’t be able to fix any paint damage with this kit, but simple little dents will be gone in no time. 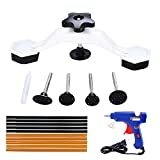 WIDE APPLICATION – The mini hot melt glue gun with glue sticks is not only for car dent removal,but also can be used in DIY home repair . INSPIRED DESIGN – Bridge dent puller with 5 pcs glue tabs is not only for car dent removal,but also can be used in hail damage and car door ding paintless repair. TIME SAVING – No need wait for the car dent repair in repair shop, most of the dent removal can be finished in half hour. ENVIRONMENT FRIENDLY – No chemicals or other toxic material are used in this process, paintless dent repair can insure 100% protect the original paint. MUCH CHEAPER THAN BODY SHOP REPAIRS – There is no high paint material & labor costs associated with a conventional repair, so it will save 90% at least by PDR tools making dent removal.